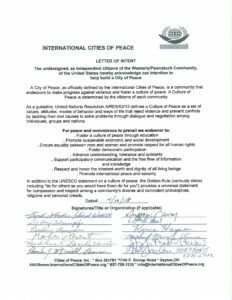 We welcome Frank Thacker and the citizens of Westerly, Rhode Island, and Pawcatuck, Connecticut, U.S.A. as the 200th International City of Peace. 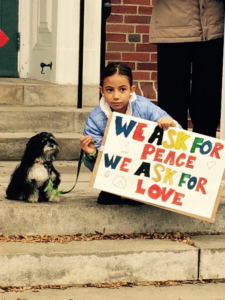 To encourage individuals and groups in the Westerly/Pawcatuck community to become involved in the process of creating a culture where conflicts are resolved nonviolently and all living beings are respected and treated fairly. To provide programs, workshops and activities that teach nonviolence as a way of life, how to resolve conflicts peacefully and fairly, how to care for the environment and how to treat all beings with respect. In our endeavors to create a culture of peace, which includes living in harmony with nature, we have much to learn from those who walked this land before us. Before either the town of Westerly or the village of Pawcatuck were created this area was inhabited and cared for by many indigenous nations, including but not limited to the Pequots, the Narragansetts, the Montauks and the Wampanoags. Many members of these nations live among us today and contribute their wisdom, insights and diversity to the culture of the area. Close to this area are two museums, the Mashantucket Pequot Museum and Tomaquag Museum. Both are rich with the history of the indigenous people who lived in this area. In our endeavors to create a culture of peace which includes living in harmony with nature we have much to learn from those who walked this land before us. The area is a beachfront community with beautiful east coast beaches. Besides being a tourist destination, the community is home to many locally owned businesses, several fine restaurants, numerous recreational sites, educational opportunities, and cultural events. It has its own daily newspaper, The Westerly Sun and its own local radio station WBLQ both supporters of peace activities. It is also home to a diverse community of musicians, artists and citizens who quietly but effectively promote a culture of peace. 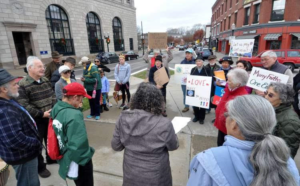 The community supports its own homeless shelter, the Warm Center, along with two community centers, the Pawcatuck Neighborhood Center and the Johnnycake Center, both of which are focused on helping people struggling to make ends meet. 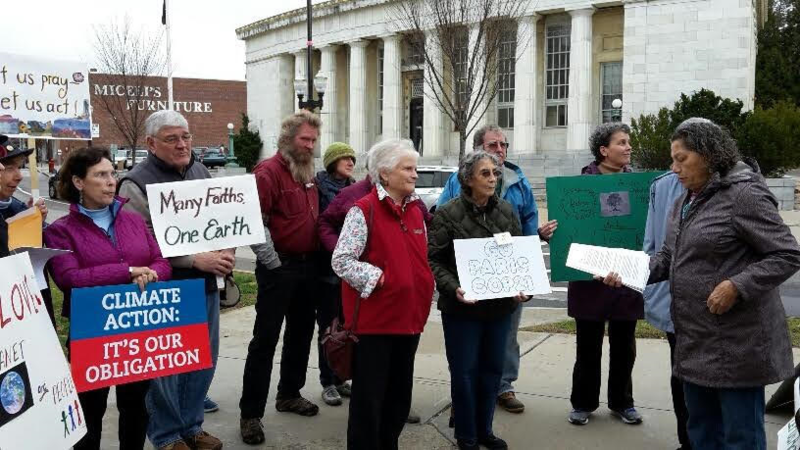 Interfaith walk for climate change issues. Conduct workshops teaching the principles and steps of Kingian nonviolence. Have Artists’ Cooperative Gallery of Westerly offer an annual “best peace art work” prize. 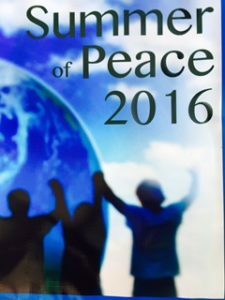 Support current and help create meditation groups focused on peace and justice. Frank Thacker MSW, MDiv. MA in Conscious Evolution. 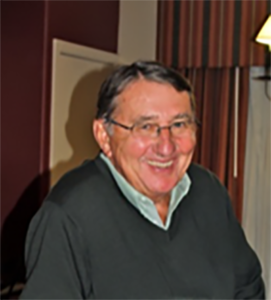 Frank is a retired clinical social worker, a Level II Certified Nonviolent Trainer and a Rhode Island Court certified mediator. He is a graduate of the International Nonviolence Summer Institute conducted by the Center for Nonviolence and Peace Studies at the University of Rhode Island as well as a graduate of the Shift Network’s Peace Ambassador Program. Frank has been involved in peace and justice work for close to fifty years combining action with contemplation. He believes strongly that the road to peace and justice passes through nonviolence and has given many workshops and classes on nonviolence and creating a culture of peace based on the Principles and Steps developed by Dr. Martin Luther King, Jr. He is also a member of the Westerly/Pawcatuck Peace and Justice Group. 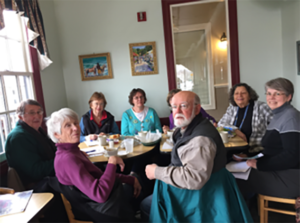 During the past five years this group has, among other activities and programs, established a local affiliate of the Shift Network’s Summer of Peace program. 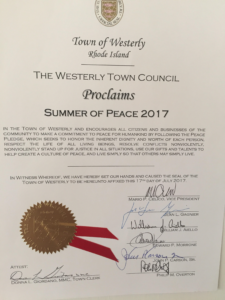 Their work in this program was the impetus that moved them to establish the Westerly/Pawcatuck Community International City of Peace. 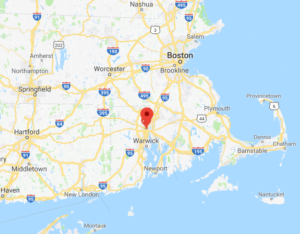 Pawcatuck is a village and census-designated place (CDP) in the town of Stonington which is located in New London County, Connecticut. 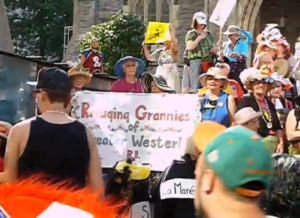 The population was 5,624 at the 2010 census. It is located across the Pawcatuck River from Downtown Westerly, Rhode Island. The Mechanic Street Historic District of Pawcatuck is listed on the National Register of Historic Places and includes sites of shipbuilding, mills, and worker housing in a 147-acre (0.59 km2) area. On the western border of Westerly flows the Pawcatuck River, once renowned for its own species of Westerly salmon, three of which are on the town’s crest. The river flows from some fifteen miles (24 km) inland, emptying into Little Narragansett Bay. 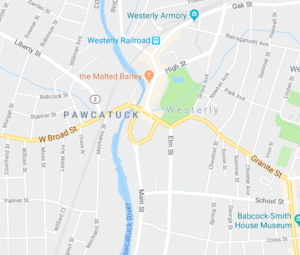 It also serves as the boundary between Westerly and Pawcatuck, Connecticut. Along the coast of Westerly lie salt ponds which serve as shallow reeflike pools whose outer walls form the long, white beaches for which the town became renowned. From west to east, these ponds are called Maschaug Pond, Winnapaug Pond, and Quonochontaug Pond. The town also has the fresh water lake Chapman’s Pond which is undergoing revitalization. A type of granite known as Westerly granite has long been quarried here. Westerly granite is ideal for statuary and has been used in numerous government buildings of several states along the eastern seaboard. The Westerly area was known for its granite and stone-cutting industry.